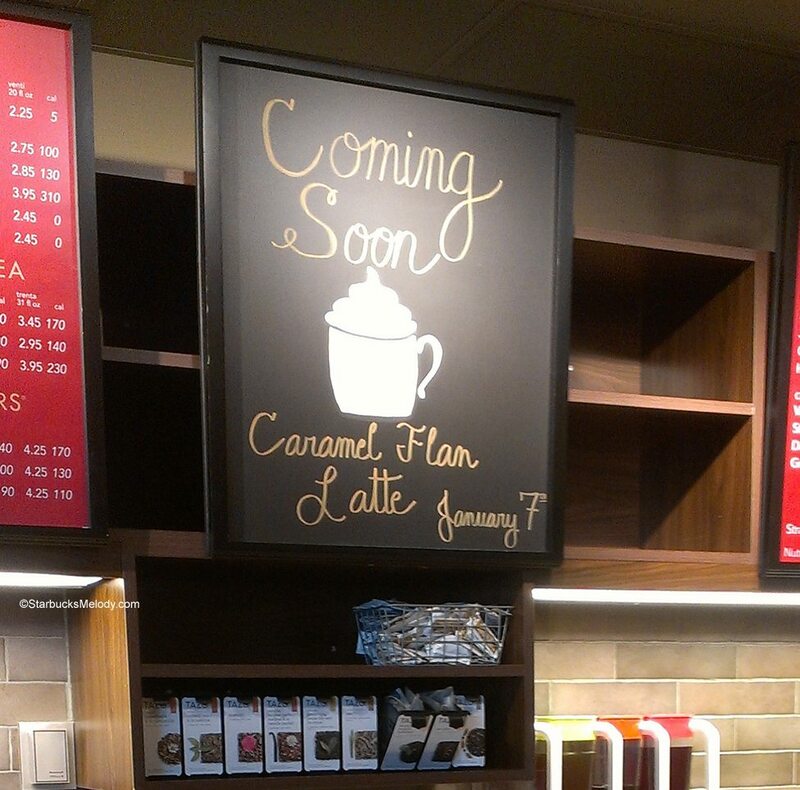 The Caramel Flan latte was actually a test beverage just one year ago. 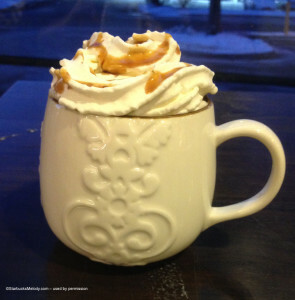 The beverage comes with a caramel flan syrup, caramel whipped cream, and caramel drizzle. I’ve tried it without the caramel whipped cream (there wasn’t any made up in the store at the time I tried it). It’s a great beverage but a little bit sweet for me. I’ve already heard about a number of baristas mentioning that the Caramel Apple Spice beverage is great made with the Caramel Flan syrup. As I mentioned, this drink has a bit of an interesting history simply because Starbucks tests many more beverages than what actually makes to a national beverage launch. For example, about one year ago, Starbucks tested a Marshmallow Mocha which seems to have not lived past the test stage. The purpose of testing is to determine if there is customer demand for the product, and whether the beverage can made profitably and at the scale (and speed) needed for Starbucks stores everywhere. Melody, Oh No!!! Another mug I will probably buy! LOL OK, I give up! I may as well face the fact that I will die owning a collection of Starbucks mugs, tumblers, pour over systems that will rival the ages of time! Casi Cielo is my favorite seasonal each year and I will own the matching mug. Wow that mug is absolutely beautiful. This drink reminds me of Caramel Ribbon Crunch from this past summer. Caramel on caramel and more caramel! And I would love to try tiramisu latte! The mug IS gorgeous. And it has a BEAUTIFUL shiny bronze interior that you can’t see. I believe this may be the first in a new series of coffee blend themed mugs, last seen in 2012. Melody, this drink is quite good, much better with the caramel whip. And the drizzle is dark caramel, not our regular caramel. Loving the syrup in blonde roast also. Melody-Happy New Year! I been hearing about this Starbucks instant “Latte” products under the both VIA and SBC(actually seeing it). Here’s the link to the SBC version : (http://www.walmart.com/ip/28805937?wmlspartner=wlpa&selectedSellerId=3&adid=22222222227000000000&wl0=&wl1=g&wl2=t&wl3=41833582510&wl4=&wl5=pla&wl6=19880599990&veh=sem). Have you been able to review them? To me it reminds me of Nescafé Instant products (http://www.brandeating.com/2012/11/review-nestle-nescafe-memento-caramel.html) . Thanks! Pretty mug! 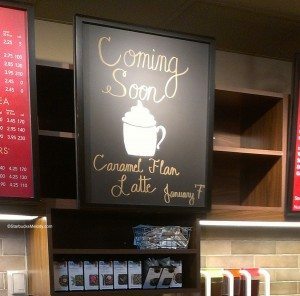 The Caramel Flan Latte does sound quite sweet from your description, but I’ll order it one time next week just to say I’ve tried it. I’m typically not a huge caramel fan, but I’m curious to see if the latte will have a hint of flan flavor and doesn’t just taste like a regular caramel latte. I have too many mugs for sure, but this mug is quite attractive. The SM at my local store said they were going to start displaying them today. Melody about how many ounces does the mug hold? @Purple1 – I saw a store manager yesterday evening starting to put out the new mugs, and I was surprised there were a few really great new ones that I might not be able to live without! 🙂 But this one isn’t in the set he was putting out. Since this mug looks like it is designed for home use, I would guess it looks like a 14 ounce mug. Once upon a time, Starbucks sold a lot of 14 ounce mugs. It was thought that people drink about a tall coffee, with about 2 ounces of milk/cream. But I’m only making a wild guess. Haven’t checked. This is a very pretty mug! I saw a few new ones that had been put out but not that one. Not sure how soon I’ll be able to get back to my local Starbucks but hopefully by next weekend. We’re getting tons of snow here today and cold temps will follow tonight. But I’m anxious to see all the new merchandise and to pick up some Casi Cielo. Looks like a new Ethiopia Reserve is coming too and it’s a Yirgacheffe! So excited!! Caramel Flan does sound interesting, will give it a try. I’ll definitely be picking up the mug! I saw this new mug this morning and as much as I like the outside design I am disappointed in the color on the inside of the mug. I would have purchased it if the color was different. While this does sound way sweeter than I would like (same as the gingerbread latte was, for me), I’ll have to get one for a friend who loves sweets. there’s also a coupon out there for a free one on january 9. (my local store is having a bit of a problem with it; they made my first one cold (?) and when i scratched my head over that, they remade it for me, but i think they left the shot out…. not tasting coffee at all.) but yes, it’s very sweet. it might be better w/o the whip. Received an email this morning stating a free tall caramel flan latte had been loaded to my account for today, January 9th only!! My local store was aware and cheerfully made the drink for me (even put it in a red cup!!!!!). It is sweet… a treat, not something I would everyday. Can the Caramel Flan Latte be made skinny? I tried today and didn’t like the caramel flan frappuccino at all. My fave latte or frapp is a white chocolate mocha/ toffee nut…MMMmm delicioso! Just had it today and it did not have much difference from a regular caramel latte. I won’t be having it again. It’s awful. I wish they would just sell Caramel Brule all year long. Starbucks ended it early this year for this horrible flan stuff and it’s a disappointment. I love the caramel flan latte. I have only been buying the caramel machitto ( hot and cold ) but my mom told me about it and she said it was good so I got one on my way to work and I LOVE it!!!!!! It is not that sweet actually. I have to add more sugar to mine and I also get extra caramel flan syrup. The caramel syrup they put on the whip is so delishious. It really is like the caramel part of a flan.